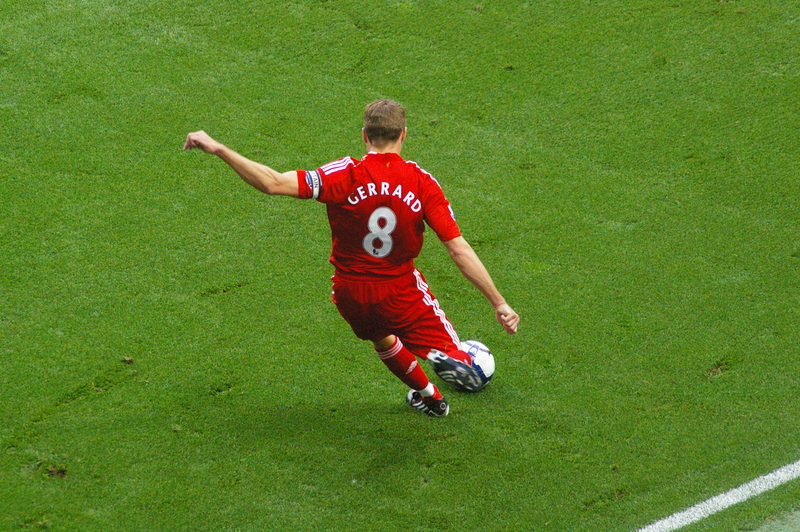 Chelsea vs. Liverpool : 4 October 2009. On Saturday evening, Judy and myself went to a surprise birthday party for a former boss ( who used to work with the both of us ) who now lives in Thailand. It was a great time. I met a few former work colleagues who I hadn’t seen for a while. I spent quite some time chatting to Steve, who also lives in Frome, but who is a Liverpool fan. How fateful that we should meet up for the first time in ages on the eve of the Chelsea vs. Liverpool game. Our first concern was to check how United had got on…he had been listening on the radio on his way to the party and confirmed they were losing 2-1 with five minutes to go. “I daren’t text anyone, mate” I said. And so we learned about Rio’s brother’s OG and yet another last minute United goal. Damn. I tried not to let it spoil my night and tried to take some solace in United dropping two home points. I got stuck into some crisp Peronis and looked forward to the game. I woke on Sunday with an inevitable headache and a slight hangover. I set off at 9.45am and picked up Parky on the way up to London. The usual gang were doing a few different things pre-match. Dave and Karen were making their own way up, stopping off to look at a new car and Daryl, Gary and Alan were watching the Old Firm game in a pub in the city. Parky and myself sat down to a hearty breakfast in the café at 12.30pm and that sorted my hangover out. We stayed in The Goose for about an hour and I had a couple of pints. Rob was already there, his tan topped-up from a few days In Cyprus. Dutch Mick and a few others too. They had said that the Cyprus trip had been the best ever. They spoke of being on a beach, under a Cyprus Blues flag, with Cypriot girls giving them massages for ten euros…it sounded idyllic. The whole notion of doing some sunbathing on a beach of an island ahead of a Chelsea away game just sounded so – wrong! Especially as I wasn’t there. My mate Francis arrived at 1.15pm. He is a friend from my home town who I have known since 1978…he has always been a Liverpool fan and has been my guest at Chelsea on quite a few occasions. He was to have Glenn’s ticket and sit next to me in the MHU. He tends not to go to too many games, but this would be his eighth Chelsea vs. Liverpool game since his first one back in 1991. Much to his chagrin, he had never seen Liverpool win at Stamford Bridge. In fact, his first ever game at Anfield was the infamous game in 1992 when Chelsea won in the league at Anfield for the first time since 1937. On that particular occasion, and with the reasons being far too complicated for me to explain here, he watched from the Chelsea section and I watched from The Kop. Despite seeing Liverpool lose, he always talks about the atmosphere in that Chelsea away section as being amazing and the late Mickey Greenaway made a big impression on him! As I wasn’t “officially” drinking due to me driving, we said our goodbyes and set off for the ground very early at about 2.15pm. The weather had brightened up and there was clearly no need for my ridiculously warm new jacket. We spotted a few Scousers around and about. They were making a fair din in The Slug, now the away pub at Chelsea…it still grates to see away fans anywhere but in the ground at Chelsea, but I guess Chelsea go into away pubs on our travels and I guess its only fair that favour is reciprocated. We had a quick word with the fellows on the CFCUK stall. I had brought up an 8 by 10 photo of myself and Mickey Thomas for him to sign, but he had just left, unfortunately. It seemed so strange to be walking along Fulham Road at a leisurely pace with ages until kick-off. The sun was now out in force and it was very pleasant. We idled past the main gate, up and over the railway bridge, past The Black Bull ( where I used to do my drinking from 1988-1993 ) and down to the Fox And Pheasant. This is probably my favourite pub at Chelsea…two small rooms, but a lovely courtyard at the rear…everyone takes their drinks outside and the road, or rather the mews, was jam-packed. Parky bought me a coke – I know my limits. I explained to Francis that I usually bring “The Americans” into this pub on my “guided tours.” It was very pleasant indeed. There were photos of Frank Lampard and Dennis Wise, standing outside the pub, on the wood-panelled walls. Before we left, I had a quick chat with Ron Harris’ son Mark, who used to live in a nearby town to me for a while. I had last seen him, very drunk, walking along the Fulham Road after the Cup Final. We battled through the crowds outside the West Stand. By now, my jacket was stuffed inside my bag, the weather warm enough for just a polo shirt. My new jacket would have to wait for its official debut. Yet more queues at the turnstiles and those damned scanners…we began lining up at 3.45pm and we hoped we would get in on time. Throughout the build up to the game, I knew there was a black cloud hanging over me. We had leant that our match day neighbour Tom had lost his beloved wife, Josey, on Monday. We had heard from his daughter that Josey had gone into a care home the previous week, but her passing had shocked us. At 3.50pm, Alan – who was already inside – phoned me to say that Tom was there, he was emotional, and asked me just to talk about the football. As Francis and myself ascended the stairs, I braced myself. We reached our seats with a minute to spare. I reached over and gripped Tom tightly by the hand and briefly looked him in the eyes. I gave his hand an extra special squeeze. It was a perfect day for football. 1. Name three of the four players who scored for us in our 4-1 over Liverpool at Anfield in October 2005. 2. How many times have we played Liverpool in the CL? 3. Which striker scored his one and only goal for us in our 1-1 draw with Liverpool in the 1998-99 season? 4. John Barnes famously rapped on “World In Motion” but which two Chelsea players also featured in England’s 1990 World Cup song? Francis was to my left, in my seat, I was in Alan’s seat and Alan was sitting next to Tom in Glenn’s seat. We settled down for the game – as we had done every other week since we first had season tickets in the Matthew Harding Upper in August 1997. Tom had been with us all the way. It seemed wonderfully normal that he should be with us once more. Liverpool began the stronger and we struggled to get into the game. It felt odd for Chelsea to be attacking our end in the first-half. Drogba, despite a week’s rest, didn’t appear to be firing on all cylinders. We gave Liverpool too much space. Things weren’t going our way. Hilario did well to get down to turn away a free-kick which he appeared to see late. Our chances were few and far between. At half-time, Tore Andre Flo and Mickey Thomas came onto the pitch and we applauded them. We also noted Dennis Wise in the Sky studio. We serenaded him with his song from 1999. I looked around I noted that all of the people who had been to Cyprus had all returned with tans. The Liverpool support was sporadic…noisy at times, quiet at others. They only had three flags. Into the second-half and we grew stronger. However, Frank appeared to be having a quiet game. Deco was shining, though. He was full of twists, flicks and enjoyed a couple of strong runs at the heart of the Liverpool defence. Liverpool began singing “The Fields Of Anfield Road” and I commented to Alan that they even nicked that from Celtic ( the Irish “Fields Of Athenry” ). This seemed to stir the Chelsea support and we replied with first boos, but then our second-half standard of “Chelsea Chelsea” being sung to “Amazing Grace.” This usually gets sung in the second-half of away games, but we all joined in with gusto. Straight after, we moved the ball down the left and Drogba danced with the last defender, rocking him one way and then the next. A cross – on the money – and an easy tap in for Anelka. The place was bumping. Liverpool came back, but their finishing was awful. We noted that Torres was quiet. John Terry crunched every tackle and roared us on. What a leader. My friend Steve, on Saturday night, had said that JT would only smell his aftershave, but JT closed him out of the game. We taunted him. The game continued on a knife-edge…it seemed like a cup tie…we had to hang on. Hilario patrolled his area with great confidence and did a superb job as Cech’s replacement. A last-minute challenge from Ashley saved the day, too. Soon after the board was held up to signify three extra minutes, Drogba muscled his way past Carragher, right in front of Parky in The Shed Lower, and superbly set up Malouda to make the game safe. Francis shook my hand and I invited him back next season. I had a word, after Tom had said his goodbyes, to another inhabitant of our little section of the stadium. Joe is around 82 and has been coming to Chelsea for 72 years. Imagine that. He comes with his two sons and he told me he wishes he could write all of his memories down. Top man. As I waited for Parky outside the CFCUK stall, a few friends bustled by – Gary, Walnuts and Jonesy – and they were all beaming. Let’s not kid ourselves, though. We hadn’t played brilliantly, a few players did not play that well and – if I am honest – it could so easily have swung the other way. We were hit with atrocious traffic on the way out of Chelsea and then on the M4 around Windsor. We eventually got home at 10.15pm. Dedicated to the memory of Josey Crowe. RIP. This entry was posted in Season 2009-2010. and tagged 1991-1992, 2009-2010, Liverpool, Pubs by Chris Axon. Bookmark the permalink.